Californians soundly voted down Proposition 10, a victory for California’s real estate investors and a major blow to rent control advocates around the state. The Voters of California have now spoken out against the ill-conceived and badly flawed Proposition 10 by soundly rejecting it. Yesterday’s vote demonstrates that California’s voters are not easily fooled by outlandish proposals such as Proposition 10 that will never solve our serious housing crisis. Rent control has never worked to provide affordable rental housing in California. It only benefits those in place at the time rent control is passed. Just look at the situation rent control and other ill-conceived housing legislation has put us in here in California. Fortunately, last night voters had the wisdom to reject Proposition 10, which would have made our housing crisis far, far worse. Now, with the vote on Proposition 10 behind us, the Apartment Association of Greater Los Angeles and owners of rental property throughout the State stand ready to work with elected officials and community advocates to solve our affordable housing crisis with effective, workable solutions that can be implemented quickly. We have developed and are ready to propose several real and effective solutions. Congratulations to us all on winning the battle over Proposition 10. Let us today celebrate, but at the same time, we need to ready ourselves for the next set of legislative challenges. The results concluded a campaign in which supporters and opponents of the measure collectively spent $102 million to win over voters. The real estate industry — from its largest developers, like Essex Property Trust and Geoff Palmer, to scores of individual agents — contributed the bulk of the $76 million donated to defeat the measure. Advocates of rent control argued that new measures would help preserve much-needed affordable housing around the state and alleviate the pressure from rent hikes on tenants.Opponents said it would have the opposite effect, arguing that allowing new construction units to be regulated would discourage development and tighten the housing market even further. 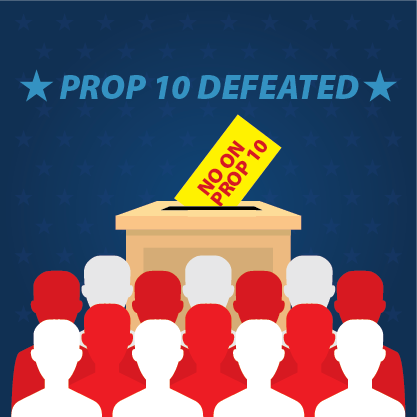 An anti-Prop 10 television campaign that played on local TV stations and streaming sites like Hulu listed “10 reasons to vote no on Prop 10” with the catchphrase, “It makes a bad problem worse.”Some tenant advocate groups in Los Angeles accused landlords of pressuring tenants to vote against the measure by holding rent increases over their heads.The Yes on Prop 10 campaign was sponsored by the AIDS Healthcare Foundation, which contributed $20 million of the $25 million spent in support of the measure. Support for the measure steadily shrank in the months and weeks leading up to Tuesday.